Discover all that Liberec has to offer with Hotel Praha Liberec as a base. All hotel's guestrooms have all the conveniences expected in a hotel in its class to suit guests' utmost comforts. Each guestroom is tastefully appointed with non smoking rooms, television, bathtub, shower, mini bar. 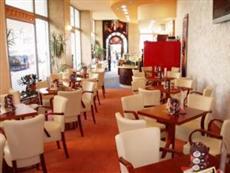 To suit guests' convenience, this Liberec accommodation offers 24hr room service, casino, executive floor, elevator, bar/pub. To unwind, guests can enjoy the leisure facilities provided on the hotel's property, including indoor pool, spa. With elegant facilities and hospitality, guests at this hotel will surely have an impressive stay. To proceed with your booking at the Hotel Praha Liberec, simply choose your travel dates and fill in our secure online booking form.